From WAMC Northeast Public Radio comes the article “Veterans Peace Group Launches Anti-Islamophobia Campaign”. 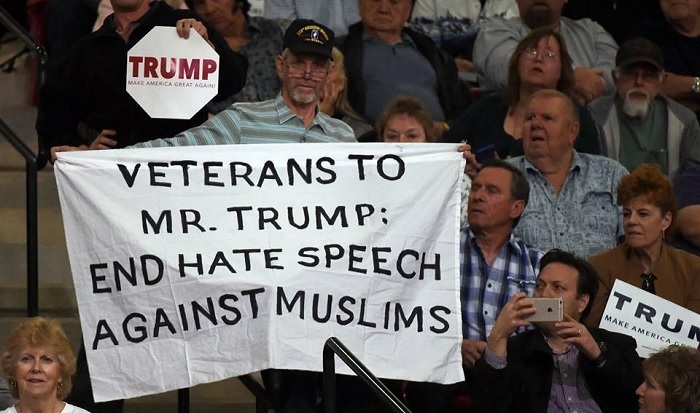 The roughly 3,500-member strong Veterans for Peace organization has started a campaign called “Veterans Challenge Islamophobia.” More than 300 veterans have signed onto the effort, some of whom have made visible appearances at Donald Trump rallies in his bid for the Republican presidential nomination. Brian Trautman of Albany is on VFP’s national board and is a campaign committee member. Currently an instructor at Berkshire Community College, Trautman served as an active-duty artilleryman in the Army for four years and became involved with peace movements during the lead-up to the Iraq invasion in 2003. Trautman spoke with WAMC’s Jim Levulis about the Veterans Challenge Islamophobia campaign.